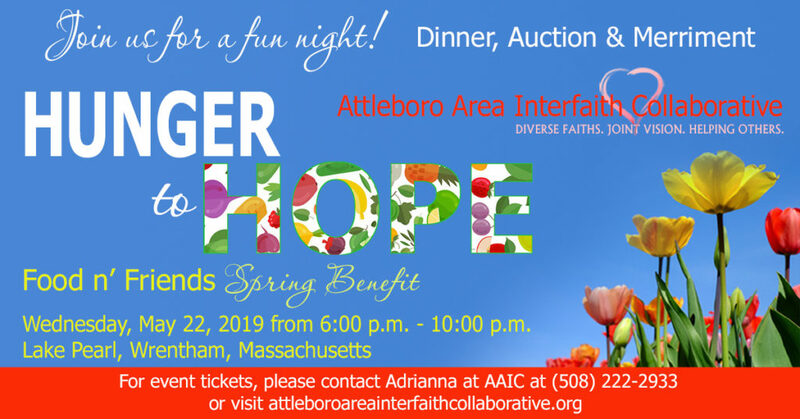 On May 22, 2019, Attleboro Area Interfaith Collaborative will hold our annual Hunger to Hope Benefit. AAIC, a 501(c)3 non-profit organization, is excited to be having this celebration of spring and giving at Lake Pearl in Wrentham. The event will include a delicious dinner, auctions and merriment! All proceeds will support our Food n’ Friends Daily Kitchens, Family Cafés and Kids’ Summer Cafés. Dinner Choices are Chicken Piccata and Vegetarian Lasagna. A gluten free meal is also available. Let us know if you have any dietary restrictions. Our Grand Raffle this year will be an Adventure and Hotel Stay in Newport, RI. More details to come. Tickets for the Grand raffle are $20 per ticket. Participation forms for Businesses and Houses of Worship (HOW) are available below. Dinner Choices are Chicken Piccata or Vegetarian Lasagna. A gluten free meal is also available.